ANGEL VIEW'S PRINCE FRANK "FRANK"
​Frank miniature poodle, merle poodle with 1 blue eye. Frank is very outgoing friendly and super smart , very loving cuddle boy . He has nice poodle conformation great coat really love this boy. ​Panda is now retired and enjoys life on the farm with the Blaylock family. She is a Junior Champion also both her parents are Champions.Panda very sweet loving girl @ 85 lbs & about 23"tall Panda's champion pedigree shows long health tested lines. She was elbow , shoulder and hip dysplasia cleared also PRA , RD , Kat , CEA . PHTVL /PHPV,DM free before she made her log trip to the USA . She is beautiful very sweet natured eager to please .We maybe a small breeder but we breed only the best . Quality not quantity is what Angel View stands for , I take great Pride in my dogs. We are beyond excited to offer such beauty and quality to our clients. Panda is very thick large boned girl. 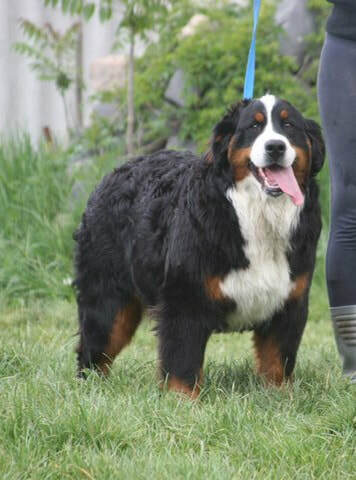 Jaye Bernese Mountain Dog AKC/CKC registered Jaye is imported from Europe. Both her parents are Champions. Jay's pedigree shows long health tested lines. She is super sweet, loving, outgoing kinda girl. Height: about 24" Weight: about 90lbs. Dora is a sweet girl very loving, we kept a of her daughter's in our breeding program GoldenMounatinDoodles in different colors. Nadia Bernese Mountain Dog registered Jaye is imported from Europe. Both her parents are Champions. Pedigree shows long health tested lines. We imported Nadia, Jaye & Panda from the same breeder. Height: about 23" Weight: about 80lbs. Dash is a sweet little boy.